We have always promised ourselves that we would ‘do a cruise’ to the Baltic’s and so about a year ago, we booked to go on the 24th June 2011. This cruise was advertised as one that visits some of Northern Europe’s most beautiful capital cities in the form of Copenhagen, where it’s possible to visit the statue of the Little Mermaid (and believe me, it is little), Helsinki and Tallinn. This cruise also includes a two-night stay in St. Petersburg which will give us the opportunity to discover the museums and palaces for which this city is famed. So the day came, and we set of for Southampton. We arrived at the Cruise Terminal (predictably Early), and within 40 minutes of checking in, we on on board and in our cabins, which were all extremely well appointed and liked by all. Phew, that’s the first hurdle over and without a hitch. Debbie’s Mum seems to be adjusting quite well (this is her first time on a cruise) though she was a little daunted at the size of the ship to begin with. She also thought the safe in her cabin was a microwave! Anyway, having checked out the facilities, we checked out the paperwork only to find that there had been a change to the planned itinerary, though as it works out, the change isn’t too bad. Instead of going to Saaremaa, we would now be going to Kristiansand in Norway. The reason for the change was that those pesky Russkies wanted to being in one of their naval vessels into our scheduled berth in St Petersburg. Rather than cutting short our stay there, they had decided to move date around a bit which did mean sacrificing one port and finding a new one. Obviously, Fred Olsen have excellent Continuity Strategies :-). Sailing out of the Port of Southampton, we cam away from the dockside then had to sit there and wait for the QM2 to come out of her berth before heading off to New York, leading the way round the Isle of Wight before she [QM2] turned right (starboard) for the Atlantic and we turned left (port) for the North Sea. The excellent evening dinner was had in the Spey Restaurant where we met a waiter who remembered us from a previous Cruise of a couple of years ago. Dinner was followed by a show, which wasn’t really our cup of tea (The Can Can is a bit too raunchy for a man of my advancing years) so, as well felt tired anyway, we all gladly went off to bed for an ‘early’ night. The next day was a Sea Day as we headed toward Germany and into the Kiel Canal. So, after a good nights sleep, we made for a leisurely breakfast (09:30) in the Spey Restaurant – Full English for me of course after which we all went for a stroll round the on board shops. Now tell me, who on earth is going to go on a 2-week cruise to the Baltic’s and then spend £27,000 on a Faberge Egg. I don’t know the answer, but I do know that it isn’t going to be me. Weather wise, the sky was grey, grey and grey with a bit of rain and a force 6 wind. The direction of the ship in relation to the wind / waves however meant that it was actually difficult to accept that yes, we were actually at sea: It was SO still. As the day went on though, although the sky remained grey, the rain stopped and it did ‘seem’ a bit brighter and even a bit warmer. Debbie introduced Nick & her Mum (Peggy) to ‘Dolphin’ racing, bet £4, won £4, bet £4, won £0. Still, it was surprisingly good fun. In the afternoon, Nick introduced Peggy to Bingo and won nothing. In between Debbie and Peggy had their nails done and I sat on the balcony and read my book: We do have a full and active time on these boats you know. So far, there has been little opportunity for photographs which is just as well as I haven’t yet worked out how to transfer them onto my laptop (forgot my card reader / cable) but I will overcome this and photos will follow. Evening bring the infamous Captains Cocktail Party where everybody gets to dress up in their best suits and frocks a has the chance to meet Captain Olav Sovdsnes and partake in some champagne – Nice. Then it’s off to Dinner – Yum Yum. Tonight however is bonus night as we are graced with the presence of Food & Beverages Manager (Michael Emmenegger) for dinner, which means that the wine and after dinner aperitif is courtesy of Fred Olsen – Result. The initial reaction of course when an Officer of the ship sits down with you for dinner is that you have behave and listen to small talk. But no, the conversation was varied and interesting: as a result we were one of the last tables to leave the restaurant, oops. After dinner we ‘retired’ to the Observatory Lounge for a couple of rather large brandy’s which were accompanied by a variety of cakes and chocolates. Yummy…. And so, off to bed. Tomorrow brings with it the Kiel Canal. Wow, what a glorious sunny and calm day today was. There genuinely wasn’t a cloud to be seen. And, even though we had put the clock’s forward by another blooming hour, the day was making it’s presence known around 04:30 though I did quickly go back to sleep. I awoke at around 08:00 to a nice hot cup of coffee, which makes a change as it’s normally that’s up and making the drinks. Maybe my cankles made me sleepier than normal. One thing’s for sure, I was in right grump for breakfast, made even worse by the fact that my full English Breakfast came with scrambled rather fried eggs, and no black pudding to be seen. I wasn’t happy. Anyway, hunger sated, we all went for a walk around the deck for another four laps (1-mile) before settling down for a well earned latte coffee and yet another session of dolphin racing and lo and behold, Master Nicholas another £6 to go with his £66 win from bingo yesterday. As today was a sea day and as the weather was as I said before, glorious, we had pretty much a lazy day sitting and reading interrupted by the need to for lunch and afternoon tea and then early evening drinks before dinner, when everybody was invited to dress like a cowboy / cowgirl: Lucky I had a chequered shirt then. Early evening brought with it an announcement from the Captain that we would be making a quick route change and head towards Stockholm in Sweden from where a helicopter was being urgently despatched to collect a passenger who had been taken too ill to continue and needed urgent medical care. Not sure what the problem was nor should it. I only wish all the very best to him or her and hope for a speedy recovery. Naturally, the detour would put us back a little and so our arrival at the next port would be later than planned. In the restaurant we sat and waited for our other table companions before ordering. We waited, and we waited and we waited and I started to wonder who was in that helicopter, and then just as I was becoming concerned they arrived:Phew. And with that we all tucked into Southern Fried Chicken, T-Bone Steak, Chilli Beans and of course Chips. Yum Yum. After dinner we ‘retired’, again, to the Observatory Lounge for a couple of rather large brandy’s. And then it was off to bed. After all, tomorrow brings with it Helsinki though maybe a little later than originally planned. What can I say about a day at sea other than to say it is probably the most effective way of relaxing. No matter how hard you try,there is only so much you can do before you have to concede defeat, sit back, accept the harsh reality of life at sea and r_e_l_a_x. Enjoy a cocktail of the day, enjoy a G & T, or enjoy, dare I say it, a cup_of_tea! (I skipped the tea). One of the consequences of too much time on your hand is that you can lose control and give into reality. As such, today, I officially became an old man. I bought a beige zip up jacket as it was both comfortable and practical, and, I looked forward to the opportunity to wear it and extol its virtues. In the mean time however, I had to contend myself with a day of idleness. But be fair, over the last four days we have conquered Russia and Estonia. I suppose what I’m trying to say is that given that it was a sea day, there is going to be little to report, save that of the sight of sea after sea after sea under sun after sun after sun. In the afternoon however we did have the opportunity to go along to a Tea Dance and I thought well, I have bought the obligatory beige jacket (I already have Velcro shoes by the way), so going to a Tea Dance is probably the next logical step. The choice was made even easier with the promise of non stop cakes of all sizes, shapes and flavours [including a chocolate fountain to dip cakes and marshmallows into]. God I felt sick but god wasn’t it yummy. After the tea & sticky buns, I think I might have had a glass of wine as well though that’s not important, we returned to the sun deck up top and just chill a little bit more where a nice little lady from the Philippines persuaded me to have a couple of San Miguel’s. Eventually however I had to be strong and get off my backside and walk round the Prom Deck at least four times (four laps equals 1-mile). 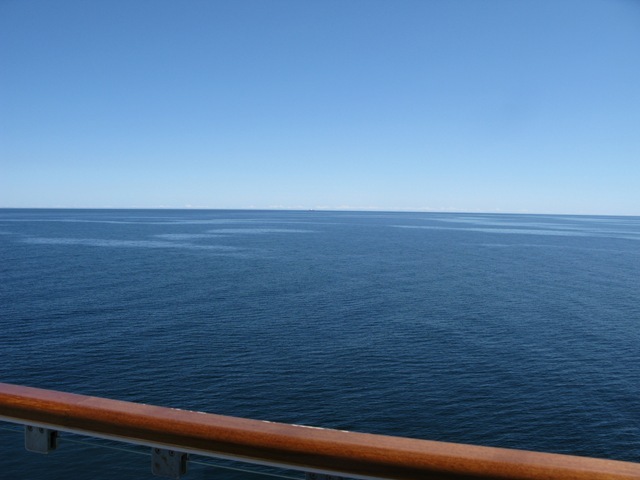 As I walked around the deck I looked out to sea (there was nowhere else to look) and noted just how flat the sea was. This was Day 9 and still we hadn’t experienced the slightest ripple. It was unbelievable. Never have I known such calm sea’s. The English Channel can be horrendous; the North Sea can be dramatic; the Baltic Sea can be unpredictable and yet so far, all had been like a mill pond. Such luck can’t hold though. After Kristiansand in Norway we have to drop down across the North Sea again but over a greater distance and in bigger seas. Until then however, we can all sit back and enjoy the sunshine, the idleness and the calmness, after which we must prepare for dinner. As usual, dinner was excellent, with marvellous staff and wonderful company of fellow travellers.Choosing from the menu was just like any other evening on the Balmoral; difficult. The choices were so varied and all so delicious. Blimey, even the stand by options for those that couldn’t decide were worth plumping for. Eventually I plumped for the Norwegian Gravadlax to start, followed by Beef & Mushroom Consommé, followed by Green Salad with Italian Vinaigrette. For the Main Course, I elected for the Rack of Lamb. Desert options were just too wonderful but knowing I had to lose weight, I opted for a Sorbet. All of this was accompanied by rather a nice Chablis and after dinner coffee with a small glass of port. How so very civilised. After dinner, we retired to the Observatory for some well earned brandy safe in the knowledge that yet again, we could put the clocks back one more hour. Still not lost any weight but hey, who’s going to mention it.